More than 50 children at the Native American Connections Coral Canyon low-income housing community in Phoenix had a happier holiday thanks to a tremendous volunteer effort from DPR’s Phoenix office. For the third year in a row, DPR Phoenix sponsored the community’s holiday party, in conjunction with the DPR Foundation-supported Future for KIDS. Tim Hyde, the Foundation liaison in the Phoenix office, organized the party for kids living there who participate in the organization. According to Hyde, the party’s success was set in motion in November, when DPR set up an Angel Tree in the Phoenix office. The goal was to purchase gifts for 49 children, but 40 generous employees raised the bar and personally donated 54 gifts, valued at $25 to $35 each, for the kids. DPR’s Mary Price organized the Angel Tree, and 10 volunteers gathered to wrap the gifts prior to the party, Hyde said. He estimates that DPR employees spent 35 hours volunteering in some capacity for the event. On Dec. 5., the day of the party, another five DPR volunteers came out to Coral Canyon to help with the event, which included four rotations for the kids, including an arts and crafts table, a cookie-decorating table, and a story-telling station where DPR’s Lew Law read “‘Twas the Night Before Christmas.” A fourth station involved candy cane races, where partners would link candy canes and race to the cones without breaking their candy canes. After rotating through the stations, the kids received presents from DPR’s Randy Riter, who once again came dressed as Santa Claus. 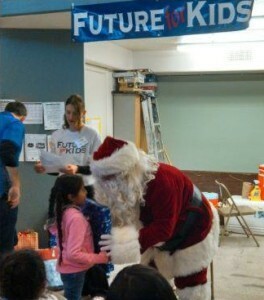 “We called each child up individually to meet Santa, and we handed them a wrapped gift. Once all the gifts were passed out, we had all the kids open them at the same time. It was a frenzy of wrapping paper flying all around, kids screaming in excitement, jumping on chairs, and just having a blast,” Hyde said. Future for KIDS is one of 15 youth organizations nationally awarded a total of $900,000 in grants by the DPR Foundation in December 2013. Since 2010, the DPR Foundation has supported Scottsdale, AZ-based Future for KIDS, which is dedicated to providing at-risk children education through mentorship and sports and fitness programs. The 2013 grant of $60,000 brings the four-year total to $155,000. DPR’s Phoenix office has raised additional funds for the organization through its Fantasy Football League and an annual golf tournament.